(CNN) -- Attorneys for 16 Indiana National Guard soldiers on Wednesday sued the largest U.S. contractor in Iraq, alleging the company knowingly exposed the soldiers to a cancer-causing toxic chemical. 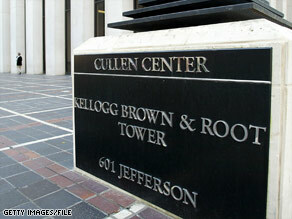 16 Indiana National Guardsmen have sued the Houston-based company Kellogg Brown and Root, known as KBR. The lawsuit against Houston-based KBR, which seeks an unspecified amount, alleges that the soldiers were exposed to sodium dichromate, an inorganic compound containing a highly toxic form of chromium known as hexavalent chromium. The soldiers say that they, along with other American civilian contractors, were exposed to the chemical at the Qarmat Ali water pumping plant in southern Iraq shortly after the U.S. invasion in 2003. KBR was tasked with getting the plant up and running using civilian contractors. The National Guardsmen were assigned to protect the civilian workers. The Guardsmen and civilian contractors who worked there have described walking on and sitting near the bright orange powder that was widely dispersed throughout the grounds of the water plant. The chemical was believed to have been left behind by forces loyal to Saddam Hussein. Some of the Guardsmen already suffer from nasal tumors or respiratory system problems and other health problems, according to the lawsuit. One of the guardsmen may have died from the exposure, though the exact cause of his death earlier this year is still not clear. The odorless sodium dichromate was used at the plant as an anti-corrosive, the lawsuit says. The chemical contained nearly pure hexavalent chromium, the toxic substance that poisoned homeowners in Hinkley, California, and was made famous by activist Erin Brockovich, according to the suit. For the Guardsmen, KBR's "knowing acts and omissions" resulted in "months and months of unprotected, unknowing, direct exposure to one of the most potent carcinogens and mutagenic substances known to man," the lawsuit alleges. A spokeswoman for KBR said the company was still reviewing the lawsuit, but denied responsibility for creating unsafe conditions at the plant. "We are not providing comment on the suit at this time. The company does intend to vigorously defend itself," KBR spokeswoman Heather Browne said. The Guardsmen say the company knew about the dangers of exposure to the chemical as far back as 2003, but did not act to protect the soldiers. "KBR managers knew full well long ago that this stuff was incredibly dangerous. But there was no information about it for years. And now these soldiers are facing some pretty serious health concerns. They're going to be stuck with this the rest of their lives," said Doyle. "The most frustrating thing is that these guys are finding out years later that they were exposed to something," said Mike Doyle, one of the Houston attorneys representing the Guardsmen. KBR took issue with the allegation that the company knowingly exposed the soldiers or anyone else and did nothing to help. "KBR's commitment to the safety and security of all employees, the troops and those we serve is the company's top priority," the statement read. "KBR appropriately notified the Army Corps of Engineers upon discovery of the existence of the substance on the site and the Corps of Engineers concluded that KBR's efforts to remediate the situation were effective. Further, the company in no way condones any action that would compromise the safety of those we serve or employ." Mark McManaway, a father and grandfather, was an Indiana National Guard sergeant at the water plant from May through September 2003, when the worst exposures are believed to have occurred. He is one of the plaintiffs in the lawsuit. "The worst part is that the military has only just recently advised us that the stuff we were exposed to was much worse than they thought while we were out there," said McManaway. "It's in our bodies, but we don't know how bad it is. Maybe within the next five years cancers could start showing up. You've got a ticking time bomb in you -- and when's it going to go off?" The U.S. military is not named as a defendant in the lawsuit. The toxic chemical made famous by Brockovich in California was a diluted form of hexavalent chromium that caused serious illnesses after being ingested by homeowners through their water. The chemical the Guardsmen were exposed to in Iraq was a nearly pure form of the chemical and could have been inhaled directly by anyone working at the plant. The U.S. Senate held hearings in August on emerging concerns about the exposure to the toxic chemicals after reports of civilian contractors and their exposure to the chemicals at the water plant. But officials of the National Guard -- and most of the Guardsmen who worked at the plant -- were not even aware of the possible dangers at the time of the hearing. Some heard about for the first time during the televised hearings. Only then did the National Guard begin efforts to find the men, some of whom had already been back in the United States for four years. An estimated 275 American soldiers may have been exposed to the chemical at the water plant, over a period of months through mid- to late-2003.